Review Of Paul Weller Gig In Melbourne, Saturday 8/16/08! – Paul Weller News! 2 Comments on Review Of Paul Weller Gig In Melbourne, Saturday 8/16/08! 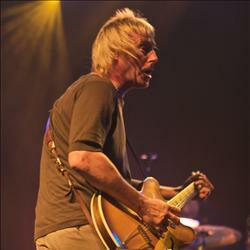 “Sorry it has taken me 23 years to come back,” Weller said as he belted into the first song `Peacock Suit`. The fans didn`t mind but Karma decided to punish him halfway through the show when the sound packed it in. “Next time I`ll bring my own generator,” he said laughing it off. As soon as the first notes of `Peacock Suit` hit, it was obvious that this was going to be one of the year`s great gigs, and we weren`t disappointed. Weller even did `A Town Called Malice”, his 1982 hit from The Jam. The classic hits were few and far between. There was only one Style Council song (Shout To The Top), and only two other Jam songs, one being the obscure `Carnation`. `Eton Rifles`, however, went right off. The solo songs are not that well-known in Australia and with a setlist heavily based around a new album `22 Dreams`, this could have gone either way. Weller could have turned the show into a homage to his hits, but he didn`t. The title track from `22 Dreams` is very Jam sounding, and with his best known song in Australia, `The Changingman` up front in the setlist, Weller pretty much established the template for tone of the show from the start. The Beatles ‘All You Need Is Love’ was a nice impromptu play that was not on his setlist. If he could ever get over his own negativity with his past, imagine a show of The Jam and Style Council plus his best solo songs added in. The Police held it together long enough to get through a tour. The Eagles manage to do it reluctantly as well. The Jam are one of those bands we all want to see do it at least one more time. weller’s thoughts on his past with the jam are well documented. in a nutshell… he’s over it. and was in 1982 – hence the split. sorry to disappoint (and i’m disappointed myself) but you ain’t ever gonna see the jam reform as the original three.and you’re not likely to see/hear weller play a ‘medley’ of hits either. he’s not one for looking back – it’s all about the present with paul. he plays the odd SC/jam song at gigs simply because he enjoys it – and, i would say, enjoys seeing the crowd react to them.btw… i was there on the sunday. another great weller gig. looking forward to brisbane and the return to melbourne next week! Next Entry Olympic Cyclist Bradley Wiggins Listens To Paul Weller’s Music!